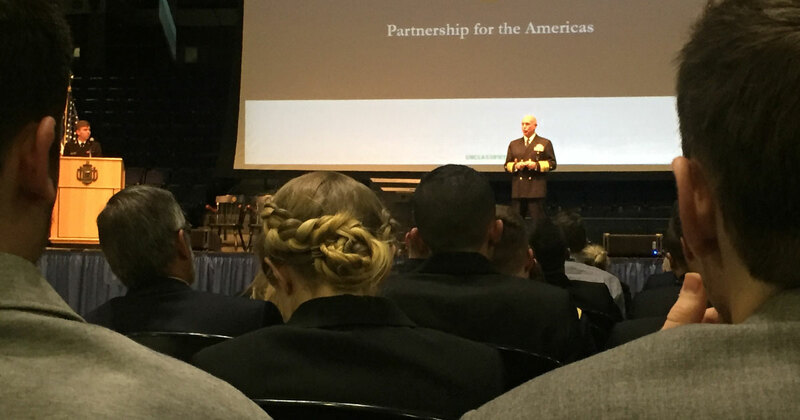 After a cold, gray weekend in Boston, I was more excited than ever by the opportunity to attend the Naval Academy Foreign Affairs Conference (NAFAC) at the Naval Academy in Annapolis, Maryland on April 10-12. This year’s topic, “Guarding Liberty in a World of Democratic Undoing,” lent itself to in-depth coverage of a wide variety of topics. Panel discussions ranged from case studies of failing democracies to the interactions between modern technology and illiberal powers like Russia and China, while keynote addresses drew from a pool of experts, including the Commander of the United States Southern Command Admiral Kurt W. Tidd and Dr. Timothy Snyder, a professor at Yale University and author of On Tyranny. Additionally, NAFAC allows time for three small-group roundtable discussions on a pre-assigned topic; each of those two-hour sessions focusing on popular uprisings sparked some of the best conversations I’ve had in my three years at Tufts. Perhaps unsurprisingly, the tone of the conference was only a little more optimistic than I’d felt previously. Common themes at panel discussions and keynotes referred often to Larry Diamond’s observation of a “democratic recession,” and on Wednesday Dr. Hal Brands from Johns Hopkins University pushed further, suggesting that this decline was merely a symptom of a greater shift in the international order. However, even these dire observations were marked by a certain amount of optimism. The case of Russia in the early 2000s, expertly analyzed by Senior Fellow at the Brookings Institution Dr. Lilia Shevtsova, served as a potent reminder that liberal democracies are worth protecting, and even the last of my roundtables on popular uprisings ended with the conclusion that the most ‘just’ revolution is one that comes from the people and ends to the benefit of the people, not just entrenched elites. As a whole, NAFAC was an incredibly educational and meaningful experience for me, and for those I had the opportunity to grow close with over the course of the week. Exchanging ideas, notes, articles, and the occasional joke with my civilian and military peers from all across the US and the world was incredibly empowering. While I remain perpetually concerned by the deluge of news alerts I get each day, it is promising to think that I will soon be entering into the world of foreign policy with individuals as who are intelligent and committed to a higher cause. Retired Ambassador Reuben E. Brigety II summed up the conference best in his keynote address during the final banquet of the conference. After summarizing the literature indicating a decline in democracy worldwide, he stopped to ask not why this matters but why we care. His response, captured almost-verbatim by my notes on the back of a napkin, truly got to the heart of the conference. Yes, the outlook for democracy abroad and at home is less than ideal – but so long as democracy remains the best form of government to ensure human dignity and human rights, we have a responsibility to preserve and protect the democracies built by the men and women before us. “History is not inevitable,” he concluded. “It is a product of decisions made by individuals,” ourselves included.